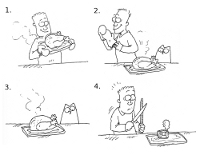 Base of operations: Somewhere in U.K.
Story: Simon's cat is a house cat who spends his time trying to catch birds and be with his friends the porcupines and the garden gnome at the fish pond. 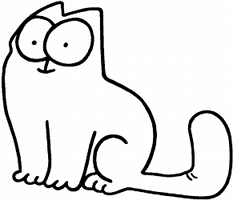 Background notes: Simon's Cat is one of the Internet phenomenons. The series started out as cartoons uploaded on the Internet, the first being Cat Man Do from 2007. The cartoons became quite popular, and eventually led to comic book collection of new gags in 2009 and an app for iPhone called Purrfect Pitch in 2010. 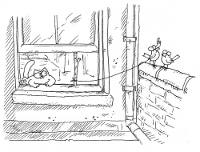 The series revolves around the cat, his owner Simon, and his friends and the birds and from the garden. Especially the fishing garden gnome and the porcupines are good friends. The series is much more subtle than some of the other popular series with cats, like Garfield and Get Fuzzy, and while the cat has a distinct personality and do thing cats normally can't do (e.g. hit his owner with a baseball bat to wake him up), it does not speak and often behaves like a normal cat. Apart from the media mentioned, quite a few pieces of merchandise has been made, e.g. kitchen magnets, coffee mugs, and cushions.